Maurice E. Parent on "Some Men"
An aging Harlem hustler reminisces. A hyper dancer frantic to score some tickets to a Madonna concert hastily sends email after email. A militant ACT UP activist tempers his anger during a visit to a hospital ward where a friend is dying from AIDS. On the day of Judy Garland’s funeral, a wistful, button down conservative at a piano bar indulges in martinis and show tunes as on the street outside, the Stonewall riots build in intensity as gays and transgender people battle New York police. A muscular, Afro-sporting stud aggressively bids for a mate at the Continental Baths. An emotionally stable, moneyed exec enjoys a day at the beach with his partner. Every actor is expected to be chameleon-like but Maurice E. Parent takes that implicit challenge to the max in SpeakEasy’s excellent staging of Terrence McNally’s tales of gay life "Some Men" - and he does it in a flash as one scene tumbles into another anecdotal sketch in this rapid paced time capsule that views eras from the Harlem renaissance to the present. Moreover, in every instance Parent mines the humanity of the character whether he has the bulk of the lines or hardly any dialogue at all. He grew up in Prince George County near Washington, D.C. His mom, now retired, was an accountant with the federal government who worked for Homeland Security after 9/11. His dad designs computer chips. They were opposed to his going into acting. They were thinking of engineering as a future for Maurice, who entered Carnegie Melon University in Pittsburgh with that goal in mind. Instead he discovered dance and music and acting. And at age 20, he got to do a dance intensive at Dance Theater of Harlem. "I’d only been dancing for a year," relates Parent in a recent conversation at a South End restaurant nearby the Boston Center for the Arts where "Some Men" continues through March 29. "It was embarrassing to be the worse dancer in a room with 18-year-olds. I did have some natural talent and my learning curve was steep so knowing the value for doing musical theater I stayed with it." Stay with it he did, next enrolling in New York University where he gained a Master of Arts in Music Theater. Along the way, his mom and dad saw how much he enjoyed being in the theater and "they’re my biggest fans now." Parent became known to Boston audiences when director Rick Lombardo cast him as Coalhouse Walker, Jr. for New Rep’s production of the musical "Ragtime." Parent had played the role at NYU - his mom hired a bus and brought 45 people to the show. Thrillingly, at that time he also met Brian Stoke Mitchell who originated the part. Introduced by a mutual friend, Stokes came up to Parent, "shook my hand and we talked together for 20 minutes!" After the New Rep production, Parent worked with Leslie Uggams in the musical "The Rink" at The Cape Playhouse as a member of the male chorus in Kander and Ebb musical. Parent remembers how stunned he was the first time he had the opportunity to perform with Uggams. "We’d rehearsed our number pretty thoroughly before she joined us for the first time in a rehearsal but when she opened her mouth and sang, we couldn’t sing. She’s such a pro and her voice is so beautiful." Parent has worked steadily for Boston companies since Coalhouse Walker, Jr. He was Black in New Rep’s "The Wild Party," Dr. Carrasco/the Duke in Lyric Stage’s "Man of La Mancha," and Belize/Mr. Lies in Boston Theatre Works "Angels in America Parts I and II." He says that for him the theme in the roles he’s performing in "Some Men," is the courage these men have shown facing the roadblocks of their eras from the 20ties through to today. "It’s the reaching out and getting what you want. We don’t have claws. We don’t have fur. What we have to use is our intellect. It’s not a matter of what is in your way, you can find a way to adapt," he said. 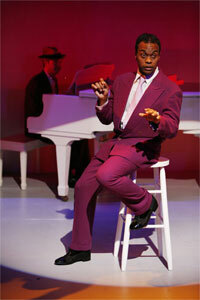 Some Men continues through March 29 at the Calderwood Pavilion at the Boston Center for the Arts. For performance and ticket information, visit the SpeakEasy Stage Company website.